I spent about an hour working on this image trying to get the colors right. I even worked on the image in 2 programs: Aperture and Capture One Pro 8, partly to test the programs in rendering color, partly to trina myself on the latter, and partly just to get one version that captured the extreme color accurately without going overboard. I went to bed thinking I might not use either one, because I could not trust my eyes and my judgment having worked on it so much — I thought it would be necessary to walk away from it for a few days and maybe posta less challenging image today. But when I woke up in the morning I liked what I saw, and was also pleased that I was able to get very similar and good results from both programs. I ended up using the Aperture version you see here, just because I prefer to keep my working catalog in one place, but the Capture One version is also perfectly fine. 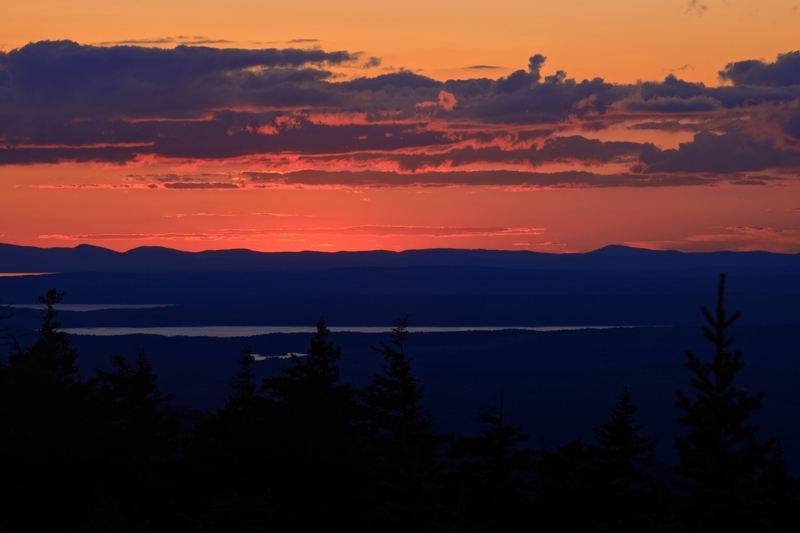 This is sunset, or specifically a few moments after sunset, from a spot near the top of Cadillac Mountain in Acadia National park. That is a stunning view, Mark. I often work on images late at night with background artificial light and leave them on screen overnight. Coming back to them fresh in the morning and seeing them by natural light more often than not confirms I got the processing right. Hey Andy, thanks for the input and feedback. It’s images like this that cause the most uncertainty, where the natural color palette from nature is so extreme that I sometimes question whether my output is too extreme sometimes. But it’s always best to check in after a good rest, and as you point out, under natural light.